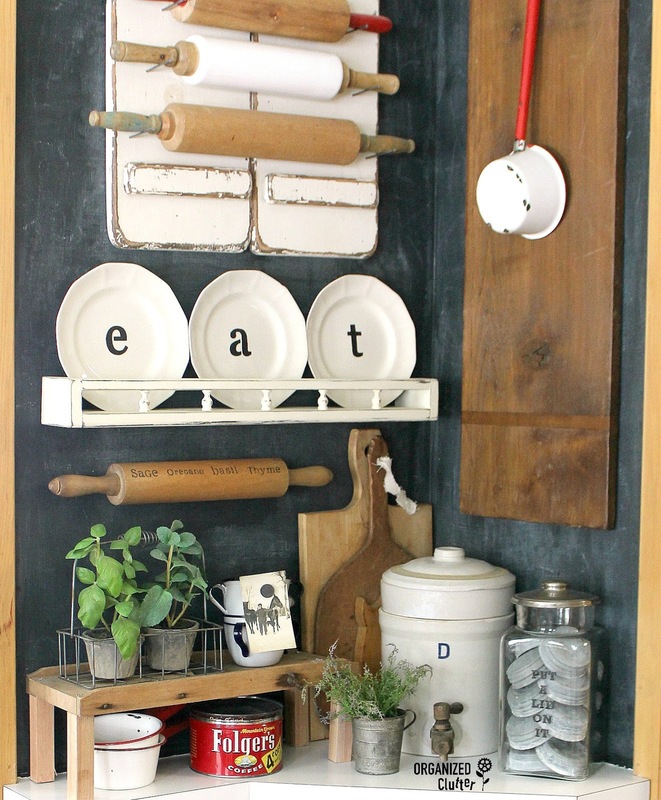 I just love vintage kitchen utensils and kitchen wares. You would think that I love to cook and bake, but that is not the case. I recently purchased these DecoArt Patio Paint Adhesive Herb Stencils . They are small, and perfect for adding stenciling to small items, like pots or plant markers. I arranged four of the herb stencils in a row on my rolling pin. Unfortunately, they didn't stick very well on the rolling pin, so I taped them in place with blue painter's tape. I think most of the problem was the curved surface. Excess cooking oils on rolling pins or cutting boards can be cleaned with KRUD KUTTER Original Concentrated Cleaner/Degreaser before painting or stenciling. 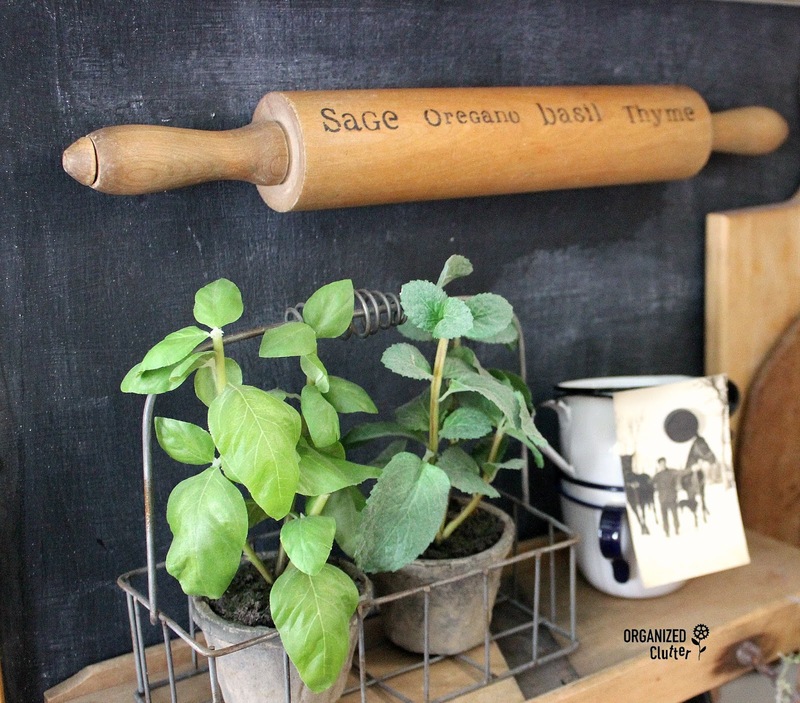 I used Fusion Mineral Paint in Coal Black to stencil the herb names, along with a Crafter'S Choice White Bristle Standard Stencil Brush-1/4" Width . The fine stencil brush worked very well on the small plastic stencils. I sanded the stenciling very, very lightly with 220 grit sandpaper to give the words an aged appearance. I sprayed the stenciling (only) with Dixie Belle Easy Peasy Spray Wax . I just purchased the spray wax last Saturday, and this is the first time I used it. I think I am going to like it! I simply wiped the rolling pin with a paper towel after spraying the stencils only. The wax is matte so it didn't look different than the rest of the rolling pin. The last step was to add a sawtooth hanger to the back of the rolling pin in the center. Actually one on each end may actually work better. I have to admit, the first sawtooth try didn't work out. The stenciling was hanging towards the bottom. The second try may have had an over-compensation, and the stenciling may be hanging a bit high. But, I am getting used to it. I put a rolled up piece of blue painter's tape on one end of the back of the rolling pin. This will hold it in place on the wall, and keep it hanging straight. My kitchen walls are all gallery walls. When most of the kitchen walls are taken up with cabinets, appliances, windows, doorways and a door to the deck, I need to use every precious inch of sheet rock! The rolling pin was hung in a horizontal open space over my built in corner shelf. Other blog projects in this vignette include the wooden slaw cutter riser, and a packing tape image transfer jar label. 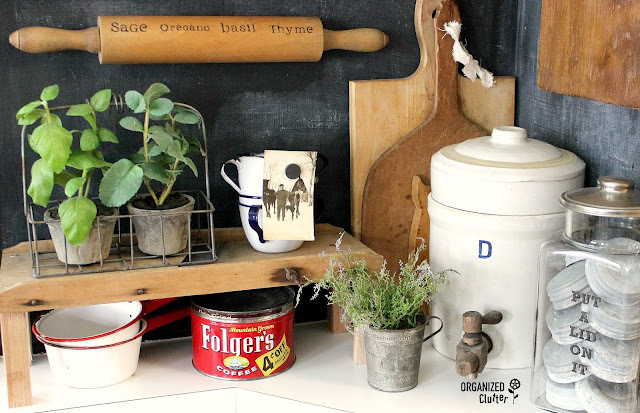 Other items here include a stoneware water cooler, faux herbs, a vintage measuring cup, a vintage coffee can, vintage enamelware pans and cups, an old photo of my great-grandfather, cutting boards and zinc lids. 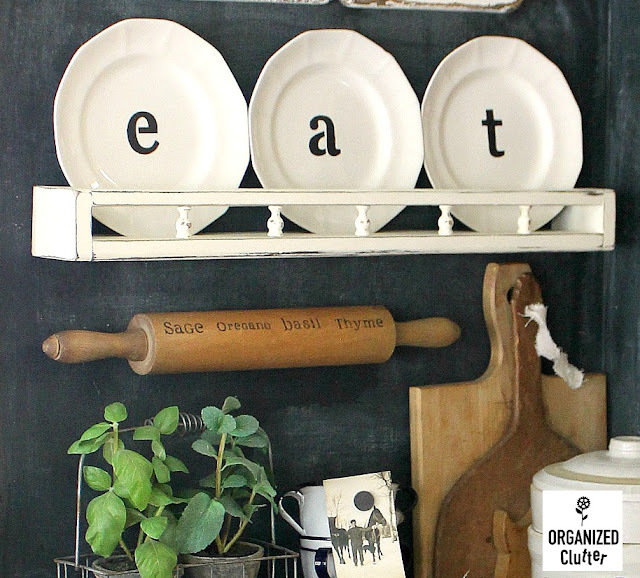 The plate rack and stenciled plate project tutorial is HERE. Information about my rolling pin display at the top of the photo can be found HERE. My long cutting board, on the right, was purchased at a local antiques shop. This, is what I call organized clutter!